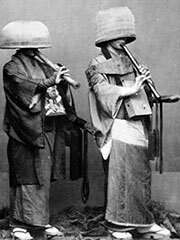 Honkyoku (本曲) are the pieces of shakuhachi or hocchiku music played by wandering Japanese Zen monks called Komuso. Komuso played honkyoku for enlightenment and alms as early as the 13th century. There are many ryu, or schools, of honkyoku, each with their style, emphasis, and teaching methods. In the 18th century, a Komuso named Kinko Kurosawa of the Fuke sect of Zen Buddhism was commissioned to travel Japan and collect these musical pieces. The results of several years of travel and compilation were 36 pieces known as the Kinko Ryu Honkyoku, listed below.